Saddle up with Horsefinder as we speak to saddle expert Adam Ellis. Whether you’re considering custom horse tack, you are keen to learn more about the importance of saddle fitting, or maybe even get started on the path to becoming a saddler yourself then read Adam’s expert insight into the fascinating world of saddlery. Adam lives in Staffordshire with his amateur showjumping enthusiast girlfriend, Victoria and works in Walsall, West Midlands. Adam and Victoria have a selection of young competition horses, which they produce for showjumping and show hunters. Since founding UK Saddles Ltd in 1999, he has been working hard to offer his customers – from happy hackers to elite riders – the best advice, support and products which enhance their riding experience and performance. How did you get into saddlery? My father was a farrier with the British Forces Veterinary Core and I took an interest in horses from a young age. Having previously worked in horse racing, I had always intended to develop my career with horses; however, it wasn’t until I watched a TV programme about saddle making that I decided it was the career for me. The programme documented how the saddlery trade was struggling to entice young people to train so I thought I would give it a go and I’ve never looked back. My qualifications include a City & Guilds level 3 in saddle making. It’s not a career where you ever stop learning and I am always looking at innovative ways of developing saddles and saddlery that will enhance the performance of the horse and riders. Are you accredited with any trade organisations? I am registered with the Society of Master Saddlers. The Society of Master Saddlers assesses the premises in which saddlers work, the machinery saddlers use and saddlers liability insurances to ensure appropriate standards are consistently maintained within the industry. How long does it take to make a bespoke saddle? It’s rare these days to find a saddler who is able to make a saddle from scratch, however, I have been lucky enough to learn how to do it to ensure that its custom made to the horse and rider. The time to make a saddle greatly depends on the requirements of the horse and rider, but I can generally produce a saddle in about a day and half – this includes cutting the leather, preparing the materials for machining and assembling the saddle myself. Do you ride? Yes I do, although these days I am more often found as a spectator. During my earlier years I used to enjoy working the racehorses up the gallops and even considered point to pointing, however, I decided that the strict jockey’s diet wasn’t something I could commit to! My girlfriend showjumps and I help to exercise her horses when she is busy. Can you outline some common equestrian behavioural problems that can be indicative of an ill-fitting saddle? I do have customers coming to me with horses that are rearing, bucking, and on one occasion a horse that walked like a crab whilst being tacked up! The issues can be linked to ill-fitting tack, but I do also see horses with behavioural difficulties that are not associated with their saddle in which the owners are looking for a quick fix for their horse’s behavioural problems. I always maintain that a saddle is only as good as the person who fits it! What do you take into consideration when fitting a saddle? When I fit a horse with a new saddle I have to take into consideration the shape and width of the horse, size of the rider and the needs of both horse and rider depending on what sport they wish to compete in. Can you explain how a good saddle can affect the rider’s position? Horse and rider performance is often promoted or hindered by poorly fitting saddles and saddlery and every rider is different. It is important to take into consideration the individual needs and preferences of riders. Some riders like the support of thigh and knee rolls, whilst I have some competitors who like saddles without them. The rider needs to feel that the saddle is stable and that their saddle enhances their riding position. It is the skills of the fitter in understanding the horse and rider that really enhances the success of the rider’s position. Is it important to have a different saddle for different riding disciplines? The majority of my riders want a saddle that can be used for a variety of sports, as finances do not allow for more than one saddle. 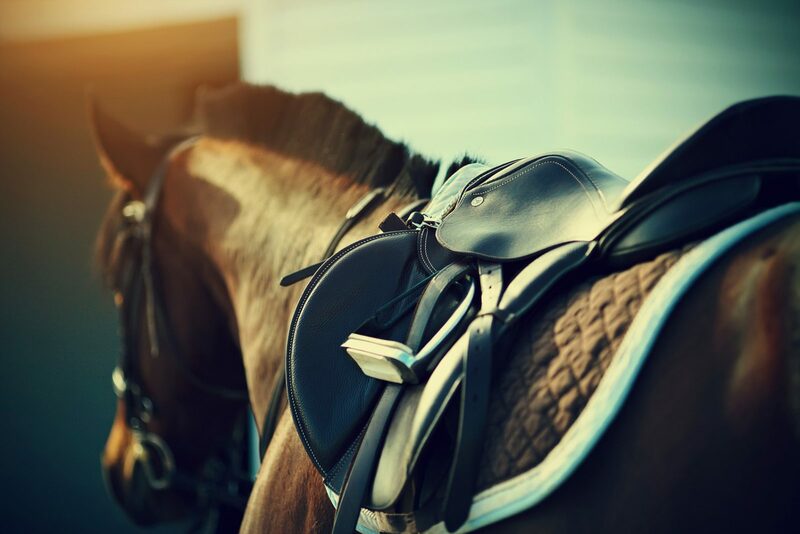 A general-purpose saddle, which is fitted to the horse and rider, is often right for these riders and I do ensure that I take into consideration what sports the rider will want to do in the future therefore making the saddle practical to their needs. Some of my customers are elite riders, who need saddles that are specific to their sport. To compete at top level, riders need a saddle that is custom made to their specific sport, their horses and their own preferences. What makes a good general-purpose saddle? A General Purpose saddle is no different from any other saddle in the need that it needs to fit both the horse and rider well. The saddle needs to be made well, from leathers and materials that will last hopefully the lifetime of their horse and make it a good investment. What is the best product for cleaning tack? If you clean your tack (as you should) after every use then I would suggest using a good glycerine saddle soap, but ensure that the cloths and sponges aren’t too wet. If your saddle gets very wet in rainy weather, then allow the saddle to dry naturally. Forcefully drying leather next to a heater will crack the leather and cause it become brittle and weak. For the many people who don’t clean their tack every day, I recommend that they use a good quality saddle ‘food’, which will penetrate the leather. Adam’s top tip: I always recommend that tack be oiled from the underside of the leather. Do you have a trade secret for cleaning brass fittings? Unfortunately not – I recommend a bit of brass cleaner and some good old-fashioned elbow grease. Would you recommend saddlery as a good career to get in to? Yes I would, it is a role that allows me to combine a genuine personal interest/passion into my work. This is a privilege that many people don’t get to have in their working lives. In my experience, I have found that I have had the opportunity to work with and meet some fantastic people and wonderful horses, – from the very best competition horses to much loved pets. There are many different ways to learn about saddlery, there are short courses, apprenticeship schemes, training schemes as well as City & Guilds qualifications. To find out more about Adam Ellis of UK Saddles, visit his website here. This entry was posted in Careers, General, Safety, Training and tagged saddle expert, saddle fitting, saddlery career.